For bookings contact gerrie@zaagkuilsdrift.co.za or bookings@zaagkuilsdrift.co.za or 0716871559. The splendour of the African bushveld and its mystical setting against the Klein Drakensberg as a backdrop, enfolds GeM Bateleur Lodge, making it the perfect base from which to experience exquisite bush life. The living area, opening onto a patio with quaint swimming pool and braai area, consists of a lounge with full DsTV, dining room, kitchen and scullery. 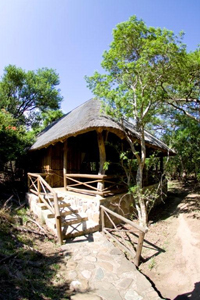 The spacious lodge, with four double bedrooms (twin- or king beds), bathrooms and a lovely outdoors loft bedroom (mosquito-netted), is air conditioned and elegantly furnished. Experience the awakening of the bush with bird song under a refreshing outdoors shower. This is a private lodge, equally suitable for a couple or for groups of friends, family or colleagues and can accommodate up to 10 people. It can therefore cater for small conferences or get-togethers. Because this facility is very well equipped it is often used as the gathering place for larger groups (up to 30 people) in which case accommodation can be arranged within walking distance in the estate. Larger conferences facilities are also available in the estate. The lodge is daily serviced and well maintained. A washing service is available. Breakfast can also be pre-arranged. 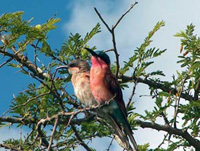 There are a number of wildlife, excluding the Big 5, to be seen in the Hoedspruit Wildlife Estate. Warthog and a variety of game are amongst the many other wildlife species that leisurely co-exist here, and several waterholes with hides provide a window from where visitors can observe the activities of birds and wildlife. 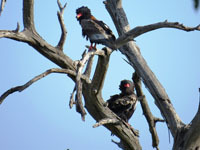 Hoedspruit boasts a vast range of game reserves, safari drives, birdlife routes and many other attractions. Some of these attractions include the Kapama Game Reserve, Timbavati Private Game Reserve, Moholoholo Rehab Centre etc. The Kruger National Park, Africa�s biggest game reserve, is situated a mere 75 km from Hoedspruit. This is a birding paradise and game viewing can be done on your own. 400 to 500 bird species are found in the area. 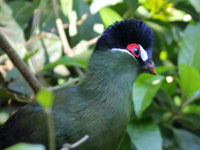 Birding excursions, to suit your level of interest and experience in birding, can be arranged with a local birding guide - on the estate or to other areas. Guided safaris to Kruger National Park, Mariepskop, Sekororo, Blyde river and more. This is called the Kruger 2 Canyon Birding Route and includes three vegetative biomes namely Montane Grassland, Afro-montane Forest, Savanna and a fascinating vegetation unit of Northern Escarpment Afromontane Fynbos with strong links to that of the Fynbos Biome which is restricted to the Western Cape - an unforgettable and educational experience for children, adults and . Be restored and refreshed by the ambiance of luxury and excellent service. 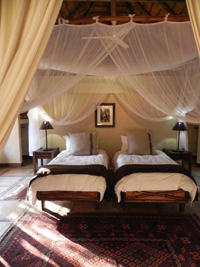 HANLIN LODGE Situated amongst lush Bushveld in the Waterberg area, Hanlin Lodge was established to give visitors who enjoy nature the opportunity to relax in comfort in Bushveld surroundings. Our core concept is to offer guests the opportunity to take that much needed break from the hectic demands of today�s lifestyle. We offer you a place to give your overloaded senses a break, where you can still see sunrises, sunsets and stars. During the hot summer days guests can relax in or next to the swimming pool. The variety of game (impala, giraffe, red hartebeest, zebra, blesbuck and warthog) and more than 155 recorded bird species ensures a pleasant walk or game drive on the farm. Visitors are welcome to bring mountain bikes for the sandy roads and even canoes to play on the dam. There are three Chalets and a Honeymoon suite on the edge of the dam. Each chalet can accommodate 6 people in two comfortable air-conditioned rooms and a double pull-out divan in the living room and has two bathrooms. Each has its own braai area. 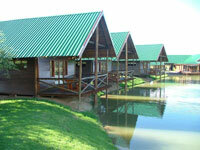 KAOXA BUSH CAMP - Self catering accommodation for birders. Come and immerse yourself in the diverse Limpopo landscape. Our bird count is over 300 species if you include the dense Limpopo riverine forest which is only six km away.We are next to Mapungubwe National Park and 4 x 4 is not needed. 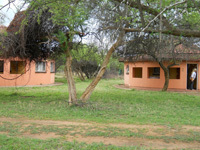 There are 6 double rooms(3 thatch cottages and 3 safari tents) each with en-suite and veranda. A fully equipped kitchen with fridges and a communal dining area and braai, compliment the picturesque camp. There is a pool to cool off in the heat of the day too. Weekends (excl. pub.holiday), pay 1night and get 1 free. 16th Dec. 3 nights for the price of 2. Christmas special (23rd Dec to 2nd Jan) 3 nights for the price of 2. Experience the bushveld on Lleweni private game farm in in Limpopo, about 8km from Naboomspruit. The farm is very scenic with a dense vegetation of bushveld and boekenhout trees, a large number of game species, 5 dams containing a variety of fish species and holds a record for 184 bird species recorded within 3 hours by the South Africa birding society, all on 1500 hectares of game reserve. This makes it a perfect destination for bird watchers. 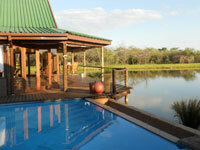 Game drives can be arranged at the main camp which has a swimming pool and cash bar. Game drives are R400 per family/ group for 2 hours. 20 species of game and 186 bird species to view on 1500 hectres of game reserve. There is also a conference centre (with helicopter landing pad), church (for weddings) and a bushveld lapa. Please call Col� on 072 672 8725 for bookings.